The Yellowstone River Lodge has new upscale cabins on the beautiful Yellowstone River and only 2 hours from the Yellowstone Park entrance. Put your boat or raft in the Yellowstone River at Columbus in the morning for some great fly fishing, picnicking, and sightseeing. Take out at the cabins mid to late afternoon just in time to barbecue on the fully equipped covered deck and take in the breath taking sunset. Cabins include a queen size bed and sofa sleeper, Jacuzzi tub, kitchenette with microwave and refrigerator, wood burning stove, air conditioning and TV with DVD player. Stay at the Bed & Breakfast in a lodge setting, rooms include a private bath. The Den has a queen size bed with a private patio and river view; satellite TV and full access to the river. The Trail Drive Room features a full kitchen, private entry, private patio with BBQ grill, king size bed with sofa sleeper. Breakfast time in the Lodge area is flexible and menu items vary. The Yellowstone River Lodge is surprisingly secluded. The area is teeming with wildlife including deer, waterfowl, fox, pheasant, beavers, wild birds and even an occasional elk. We welcome you to come and explore the historic river that lead Lewis and Clark west. Also hosting outdoor weddings and outdoor events. 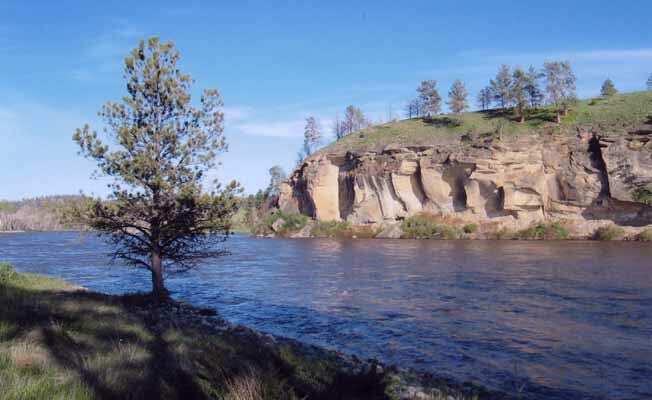 A beautiful backdrop of cliffs and pine trees viewed from our grassy meadow on the Yellowstone River.